Author and music historian Quentin Harrison fourth volume celebrates and examines the complete discography of one of pop music’s most captivating, compelling and provocative artists. In three years, author Quentin Harrison and I have been on a steady track to bring his Record Redux Series to life. And publishing this August, we'll be releasing the fourth volume on the creative, charismatic and controversial artist Madonna. The big design question: Which version of Madonna do I create to capture the cover? Every Record Redux cover I illustrate presents a challenge for me. Whereas my typical Alter Egos are truly out-of-my-head creations, these book covers HAVE to portray not only the spirit but the actual likeness of the artist. With the Spice Girls, it was about delivering their unique Girl Power personas and super-heroine stage poses. Approaching Carly Simon, I wanted a delicate, painterly likeness as lovely and effortless as her music. And for Donna Summer, I wanted regal, sleek shimmer. And then we come to the many chameleon looks of Madonna to choose from. The more Quentin and I talked—and talked and talked—about Madonna's musical journey, we both recalled the significance of her Reinvention Tour performances. There was a distinctly different kind of strength and confident self possession that Madonna was projecting on that tour. A tour that was stripped down of artifice and theatrics but was no less potent, sensational and thrilling. Hence this cover design, capturing “in action” Madonna's command of the stage, memorably performing "Nobody Knows Me" and "Vogue." Out of all the artists Quentin plans to feature in his book series, perhaps no other has managed to embed themselves so thoroughly into pop culture more so than Madonna. And while she is certainly one of the most famous women in pop music, much of what is written and discussed about her has focused more on her celebrity and shock value. Quentin's book plans to redirect the conversation around her music, spotlighting her role as a songwriter, colloborator and musical innovator. A longtime Madonna fan, I thought I knew her catalog inside and out. But as with every book I've worked on with Quentin, I found myself pleasantly surprised to discover tracks I did not know existed. And that's really what so special and distinctive about this series—you're sure to be enlightened as your music knowledge expands and your appreciation of the artist deepens. Ready in time to mark the pop icon's 60th birthday, RECORD REDUX: MADONNA will be available this August in soft cover format on Amazon.com and as an e-book on the Selz.com storefront. Harrison's first three books are available now, so start building your collection! 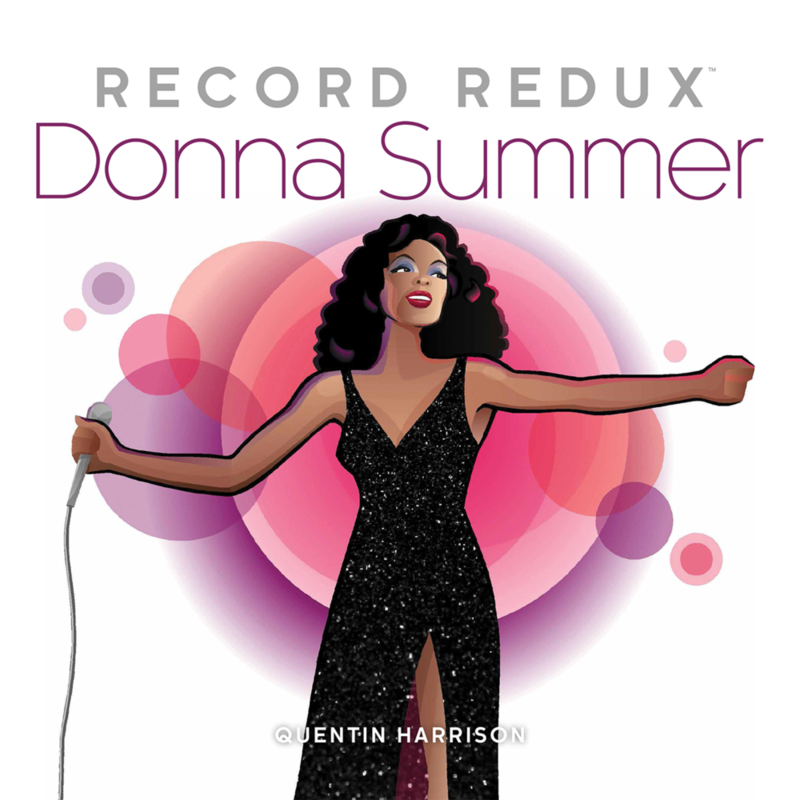 It's hard to believe that within a two year period, author Quentin Harrison and I are celebrating the completion of book #3 -- RECORD REDUX: DONNA SUMMER. Each book has truly been a labor of love, and I think it's becoming clear to people who have purchased and read these volumes that Quentin is dedicated to restoring the full legacy of these music icons. For those who live in the Atlanta area, I invite you to attend our book launch party on Thursday, January 25 at Noni's Bar & Deli in the Edgewood neighborhood. Festivities start at 7pm with great music and a limited quantity of book available for purchase! Check out our e-vite promo below. And just because we're taking some time to raise a glass on finishing another book, that doesn't mean we'll be idle for too long! Quentin is starting work on the fourth volume coming this August, RECORD REDUX: MADONNA. Sure to be our largest book to date, we have some special surprises lined up to spotlight one of the most enduring, captivating and provocative women in pop music. Stay tuned for future updates (and possible sneak-peeks at the Madonna cover design!) 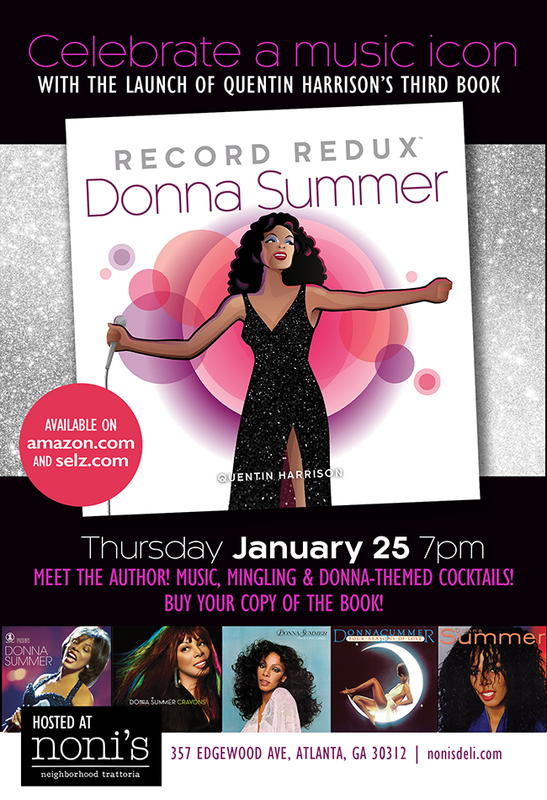 -- and in the meantime, I hope you start discovering the music catalogs of the Record Redux Series spotlight artists: Spice Girls, Carly Simon and Donna Summer. I know that my music appreciation has greatly broadened since I've started this creative journey with Quentin. My personal music collection has grown considerably, as has my thirst to learn more about the music artists I thought I knew well. I enjoy finding new ways to apply my Alter Ego creations, the latest offered through Shop Vida, a women's fashion e-tail site that showcases apparel and accessories from independent designers. I recently set up my storefront on shopvida.com and plan to add new designs over time. Right now, I'm offering designs on a tote, clutch, cashmere silk scarves and flowy wraps. But I plan to add more designs over time and send out updates. They also offer a range of chic T-shirts and tops, so I may expand into that area as well. I ordered a cashmere silk scarf that should arrive sometime this week, so I will definitely post it once it's here! I ordered the Pop Tote FUNK to check out the quality for myself. The bag is well constructed, and the print/image quality exceeded my expectations, beautifully capturing all of the color gradients and fine details. The bag does not feature any interior pockets or compartments, so this bag is best suited as a useful catch-all. Durable and machine washable, the tote is ideal for casual outings. Great for holding yoga gear or everything you need for the pool or beach, this roomy bag can handle anything.